"You invade Poland, you invade Warsaw, and now you invade my dressing room. You people are compulsive invaders." About as mainstream a Mel Brooks comedy as we'll ever see, To Be or Not To Be refreshingly relies on its narrative�instead of gimmicks and gags�to wring its laughs. And though it may not be as archly sophisticated as the 1942 Ernst Lubitsch classic on which it is based, this daffy yet endearing World War II farce guilelessly entertains. Brooks and his real-life wife, Anne Bancroft, in their only joint screen appearance, portray Frederick and Anna Bronski, a married theatrical couple who could be billed as the Lunt and Fontanne of Poland. Frederick fancies himself a great Shakespearean actor (specializing in Hamlet's soliloquy), but he's really just a hard-working ham, and he and the glamorous, self-absorbed Anna bicker, coo, and upstage each other during their long-running vaudeville revue. After the 1939 German invasion, a young army officer (Tim Matheson), who once had an impetuous fling with Anna, returns to Warsaw as an undercover agent, and enlists the Bronski troupe to help retrieve a directory of Polish underground members before the traitorous Professor Siletski (Jos� Ferrer) turns it over to the Gestapo. Frederick must call upon every ounce of his thespian talent to execute the mission, as he impersonates a high-ranking German colonel and even the F�hrer himself to secure the document. Almost 40 years removed from World War II, the Brooks version of To Be or Not To Be doesn't possess the original's topicality, which laced its humor with an edgy bite. Instead, a warm, nostalgic air pervades the proceedings, with moments of tension and even poignancy�as well as a not-so-subtle message of social tolerance�supplying welcome texture. Brooks hardly plays it straight (it's just not in his nature), but tries his best to create a character, and it's a treat to watch him interact with Bancroft, whose elegance nicely tempers his vulgarity. From the opening musical number (a snappy rendition of Sweet Georgia Brown sung in Polish), the couple exudes a contagious enthusiasm that extends to the supporting cast. Charles Durning earned an Oscar nomination for his portrayal of a befuddled Nazi, and a pre-Back to the Future Christopher Lloyd gets a chance to hone his comic chops as a Sgt. Schultz-like adjunct. To Be or Not To Be may not be monumental or even memorable, but it's a pleasant way to spend a couple of hours. Mel and Anne make beautiful music together, and this innocuous romp is worth watching for them alone. Image Transfer Review: Colors are vibrant and well saturated (especially the red in the swastikas), but a fair amount of grain lends an overabundance of texture to the image. Still, the movie possesses that lush Golden Age glow, and few print defects tarnish it. Contrast flags in a few places, but is solid overall, and fleshtones are true and natural-looking. Audio Transfer Review: Both stereo and mono tracks are included, and offer average fidelity. The stereo option provides a few instances of distinct channel separation, which gives the film a bit of theatrical flair, but most of the audio falls into the standard category. Dialogue is always clear and understandable, and the musical numbers sound appropriately robust. Once again, any age-related defects have been erased, leaving us with a good, clean track. Extras Review: A vintage featurette running just two-and-a-half minutes is little more than a studio promo littered with film clips, but it does give Brooks a moment or two to discuss his movie. Similarly brief�but slightly more substantive�profiles of Brooks, Bancroft, and Durning follow, as well as several trailers for Brooks films. Not as topical as the 1942 original, but still an entertaining farce, the Mel Brooks version of To Be or Not To Be at last offers the legendary funnyman a more traditional role, as well as a once-in-a-lifetime chance to co-star with his real-life wife, Anne Bancroft. The two make beautiful music together, especially when they sing Sweet Georgia Brown in Polish! 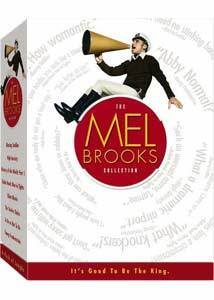 A change of pace from typical Brooksian fare, this breezy, substantive comedy nicely complements the loonier titles in The Mel Brooks Collection.